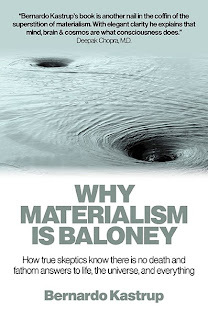 Cover of Why Materialism Is Baloney. 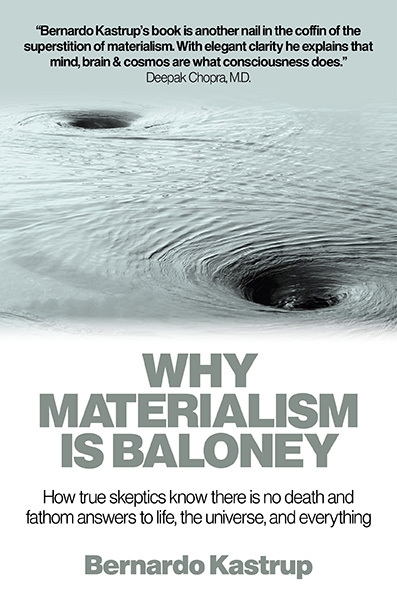 Today I want to share with you an overview of my upcoming fourth book, tentatively titled Why Materialism Is Baloney: How true skeptics know there is not death and fathom answers to life, the universe, and everything. The manuscript is currently complete and discussions with potential publishers are ongoing. For far too long has the cultural debate been framed as materialism versus religion. Materialism has, unjustifiably, gone unchallenged as the only viable metaphysics as far as clear rational thinking. Why Materialism Is Baloney seeks to change this and reframe the cultural debate. It uncovers the internal contradictions and absurd implications of materialism, and then presents a hard-nosed, non-materialist metaphysics substantiated by hard empirical evidence and clear logical argumentation. In this, it is a unique and much needed work that closes a glaring hole in today’s cultural dialogue. Why Materialism Is Baloney articulates a surprising and compelling way of looking at nature, the laws of physics, and our condition as conscious beings. From that basis, the book lays out a coherent and logical framework upon which one can model, interpret, and explain every natural phenomenon and physical law, as well as the modalities of human consciousness, without the unlikely assumptions of materialism. If the hypotheses and formulations of the book are correct, consciousness does not end at death, the brain being merely the image of a process by which mind localizes its own flow. Physical death entails a de-clenching or delocalization of awareness. The brain is in mind, not mind in the brain. And there is no abstract, strongly-objective universe outside of mind. Unique in the modern intellectual discourse, the book challenges materialism on the basis of reason, empirical evidence, and skeptical argumentation, articulating ideas in clear, matter-of-factly, and direct language, with no use of loaded spiritual or religious terminology and concepts. The book starts by laying out the key premises and implications of materialism and highlights materialism’s influence in our culture and value systems. The following chapter discusses the mind-body problem, offering a coherent view of the relationship between mind and brain according to which the brain is merely a localization mechanism of mind, a view that is substantiated with abundant empirical evidence. Thereafter, the book presents a modern and powerful formulation of the philosophy of idealism, according to which all reality is fundamentally mental. A series of metaphors are then discussed, each with an increasing level of complexity and explanatory power, which seek to make sense of all natural phenomena in terms of an idealist framework. The metaphors explain the division of the medium of mind into conscious and ‘unconscious’ segments, the origin of the laws of nature, and why they feel so separate from us. They explain the relationship between different individual minds, the nature of altered states of consciousness, mystical experiences, and many other phenomena. These metaphors are the main contribution of the work, for they offer a compelling new way of thinking about reality, scientific discoveries, and personal identity. The book closes with a series of more speculative ideas regarding the afterlife state, psychic phenomena, and other subjects of general popular appeal. The materialist worldview and its counter-intuitive, absurd implications. The influence of materialism in the cultural zeitgeist. The mind-body problem: the relationship between the brain and the mind. A powerful explanation for the undeniable correlations between mind states and brain states that does not entail that the brain generates the mind. A powerful and modern formulation of the philosophy of idealism, according to which all reality is an essentially mental phenomenon. A compelling articulation of a metaphysics according to which the body is in the mind, not the mind in the body. The relationship between the laws of physics and idealism. An explanation for how, if reality is a projection of mind, the world seems so separate from us and governed by seemingly objective laws. Coherent and compelling explanations for altered states of consciousness, mystical experiences, psychic phenomena, near-death experiences, etc. Good night Bernardo. I have read by mere coincidence some of your thoughts and I must say that you might be close to achieving better understanding of the correlative relation between mind and self (if they are not the same). I am not a scientist at all, but I am certain of the things what my brain has allowed me see and can attest that realities vary depending on the observer. Understanding awareness is quite complicated because (1) you must first realize you are aware of things other are not and (2) there is always the underlying thought re-directing your attention to physical rules. Now I dare ask you a question regarding evolution: Isn´t it possible that our brains limit one´s perception just because our mind/self is not ready to see beyond? Don´t you think it is perfectly feasible that when our self has evolved, our brains will change. I know my brain is different. What I do not know is why. I apologize if my English is not good. It is not my native language. You asked: "Isn´t it possible that our brains limit one´s perception just because our mind/self is not ready to see beyond?" I would resist this. It makes it look like the brain, or something related to it, is an entity with a separate agenda from ourselves. I tend to see the brain simply as the image of a natural, spontaneous process of mental localization. It is this localization that allows a form of self-reflective awareness to arise (I elaborate on this in the book), so there could be a teleology -- a purpose -- behind localization. But I personally resist the idea that 'we are not ready.' It sounds a bit paternalistic to me, and I instinctively recoil from that. On the other hand, this could be just a personal bias of mine. Sounds like it's going to be a great book - can't wait to read it! Just came back from the "Look Within" feature over at Amazon. Your book looks great and I look forward to reading it. I have one question - does it conclude with idealism or go beyond to nondualism? I assume the Zen roshi who wrote your forward holds a nondualist view, so I'm also assuming that you're "using" idealism as a juxtaposition to materialism, as a kind of "antidote", after which you can drop the view of idealism as well. Great that you enjoyed the preview! The word 'dualism' in philosophy is normally used in the context of 'substance dualism,' the matter vs soul idea. I start the book with a dualist metaphor in this sense, and then transpose it to idealism. Non-duality is broader than dualism, in that it denies all dualities -- conceptual and ontological -- not only that of matter and soul. It is very difficult to go beyond idealism in a conceptual argumentation, since language itself is based on myriad dualities (verb/noun, past/future, subject/object, I/you, etc.). So I do not explicitly endorse non-duality, for I found no coherent way to do it. I do, however, try to point at it in the last chapter, especially in a section called "Do we need the word mind?" I trust those readers with the eyes to see it will get what I am trying to hint at. This question is a little off topic, but what do you think of the tulpas of Tibetan Buddhism? If idealism is true, then we might expect that communities of sentient beings create tulpas unintentionally as a materialization of repressed desires? Great question, Juan. In Buddhism, the tulpa is considered ultimately to be a 'hallucination,' not part of consensus reality. But 'hallucinations' can have strong momentum, staying power, and even a form of autonomy. The ability of mind to create 'thought-forms' (tulpas) with huge momentum -- through habit, focus, and repetition -- is recognized scientifically. Obsessive-Compulsive Disorder and Hypochondriasis are examples of how this can happen in an undesirable manner. The question, of course, is whether these thought-forms can actually become 'physical;' that is, whether they can become part of consensus reality, so that anyone around would also experience the same tulpas, not only those who generated them. Personally, I think the ego is incapable of manipulating consensus reality this way. Clearly, consensus reality is generated by a part of mind that transcends the ego, otherwise we would all be able to make our dreams come true. Therefore, it is logical to expect that, to change consensus reality, one has to operate from the part of mind that generates it in the first place. That is the (collective) unconscious, not personal egos. Now, could enough mental focus cause a wish, repressed desire, or even a fear to sink into the deeper layers of the unconscious and, from there, influence consensus reality? That is conceivable, and I wouldn't discard the possibility. I discussed this, at a very speculative level, in my earlier book 'Dreamed up Reality.' I even produced some computer simulations to test the basic premise of the idea.